GV-Storage System V2, the IP SAN storage system, is a high-performance RAID storage system based on the latest iSCSI technology for users looking for a cost-effective and shared storage solution over the network. Compared to the desktop PC and consumer NAS system which only allow for 2 ~ 8 hard disks for data storage, GV-Storage System V2 is equipped with 24 hard disk drives, storage capacity up to 144 TB (with 6 TB HDD). 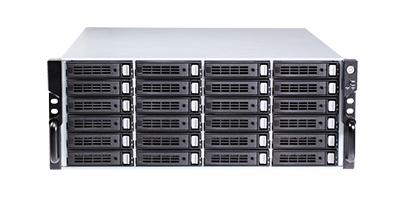 GV-Storage System V2 can connect to 7 units of 24-bay GV-Expansion Systems, JBOD systems, increasing storage up to 192 hard disks with 1,152 TB. 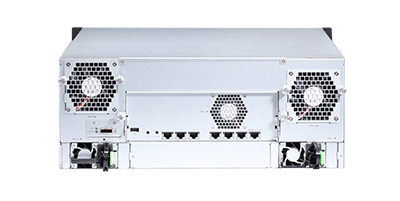 GV-Storage System V2 has fully redundant components including power supplies, fan modules, and SAS JBOD expansion ports linked to GV-Expansion System. All of these components are hot-swappable to create a high availability platform and provide non-stop services. GV-Storage System V2 is compatible with GeoVision Surveillance Systems and Software. With its large storage capacity and high availability, GV-Storage System V2 is an ideal choice for safe and long-term data storage. The maximum number of channels supported by GV-Storage System V2 varies with the resolution, as listed below. It’s highly suggested to keep the total bitrates under 2700 Mbps for better recording performance. RS-232 Cable (For UPS, phone jack to DB9 male).